If Vietnam is the Southeast Asian tourist destination of the future, perhaps Thailand could be considered its older brother. There is a prevailing wisdom that the Vietnam of today resembles Thailand, but 20 or 25 years ago. Indeed, Thailand’s total gross domestic product is calculated at around $514 billion, just over twice Vietnam’s GDP. Directly and indirectly, tourism is estimated to constitute as much as 20% of Thailand’s GDP—the largest tourist economy in Southeast Asia—compared to 9.1% in Vietnam. Tempting as it may be to imagine a straight line from present-day Thailand to the Vietnam of the future, the two nations have very different histories. Thailand did not face, as Vietnam did, a recurring threat of invasion, occupation, colonization, or war. Not until the late 1980s did Vietnam transition to a market-based economy and open broader economic channels to the rest of the world. Thailand, on the other hand, has long been an exporter of goods to Asia and beyond. The Thai automotive industry is the largest in Southeast Asia, and the 12th largest in the world. As we explored in our first piece on Ho Chi Minh City, motorbikes are the dominant mode of transportation in Vietnamese cities. The statistics are telling: of the registered motor vehicles in Vietnam, 45 million are motorbikes and only 2 million are automobiles. The stark difference in automobile ownership and traffic between Thailand and Vietnam might seem naturally correlated to the size of their respective economies, and citizens’ ability to afford a car—but there are other reasons for this. Production and sale of motorbikes haven’t ceased in Thailand. For example, almost as many motorbikes as automobiles were produced in March 2018, and far more of them were sold domestically than were cars; only 16% of motorbikes produced were for export versus 56% of automobiles. This would suggest that motorbikes are being used for short trips within districts and neighborhoods, and less so for longer commutes and regional travel. Heat, humidity, rain, and traffic no doubt present daunting challenges to the pedestrian. 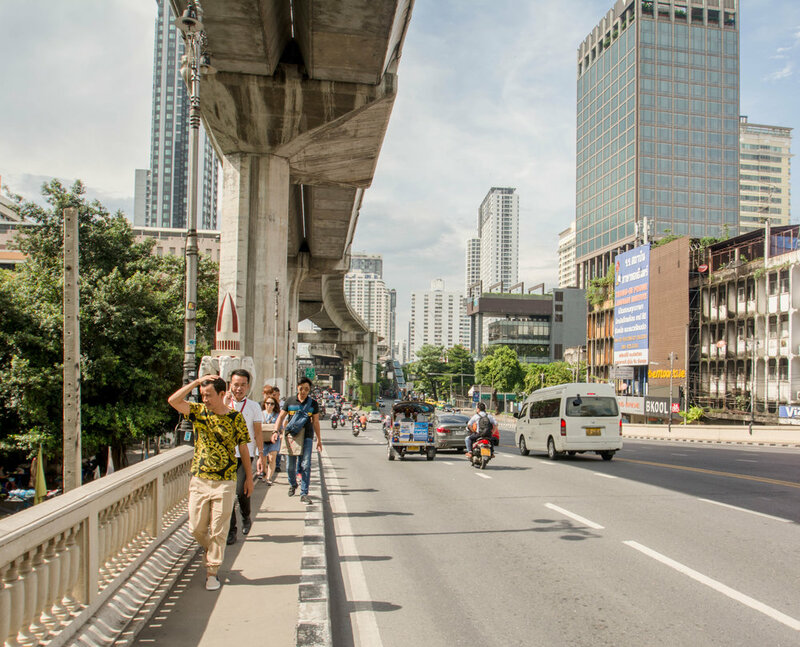 Many projects in Bangkok provide ample shelter from the weather, access to elevated rail transit platforms, and safe passage across large roadways—but they also keep pedestrians above and away from the street. This physical separation of the pedestrian and vehicular realms promotes a radically different sort of streetscape: one more defined by large-scale retail than informal, active streets. Statistics on Bangkok from Thailand’s Department of Land Transport, and Bangkok’s Traffic and Transportation Department, seem to support that suggestion. The growth rate of motorcycles on Bangkok roads was only half that of private car growth from 1994 to 2006. As of 2006, Bangkok’s fleet contained 51% of all private cars in Thailand but only 14% of the country’s motorbikes. By 2029, it is estimated that taxis and motorbikes will make up only 16.5% of trips in the city versus 41.1% from private cars. Such a shift in transportation mode in a city as large and urban as Bangkok is stunning, considering the existing level of traffic congestion, but there is some optimism in the statistics. Despite the projected increase in private car trips, Bangkok officials also anticipate a much greater rise in trips made on mass transit. 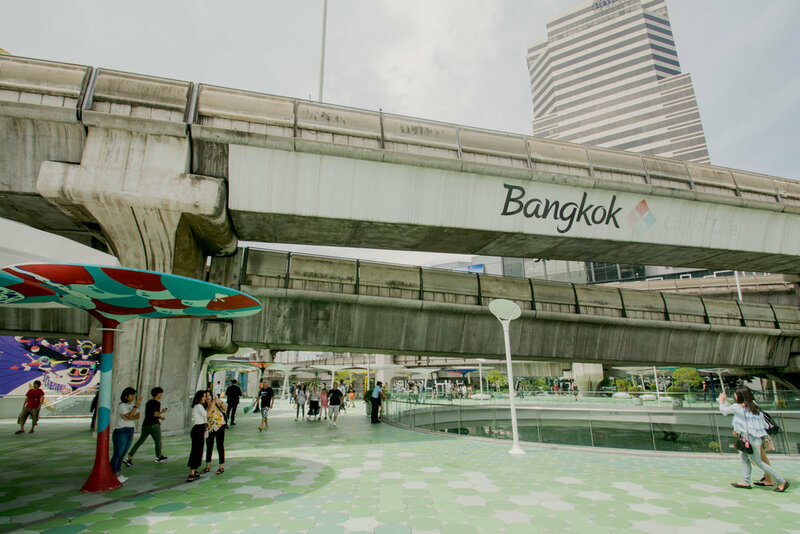 The city already provides mass transit options: since 1999, the BTS Skytrain has operated in central Bangkok and undergone two expansions, with over 600,000 daily trips on average; the MRT, Bangkok’s subway, moves as many as 240,000 passengers daily; for the transit rider on a budget, canal boats ferry passengers on east-west routes at a breakneck pace for a more affordable price. The city’s master plan for mass transit is extensive, including comprehensive expansion plans for the Skytrain and MRT as well as bus rapid transit. 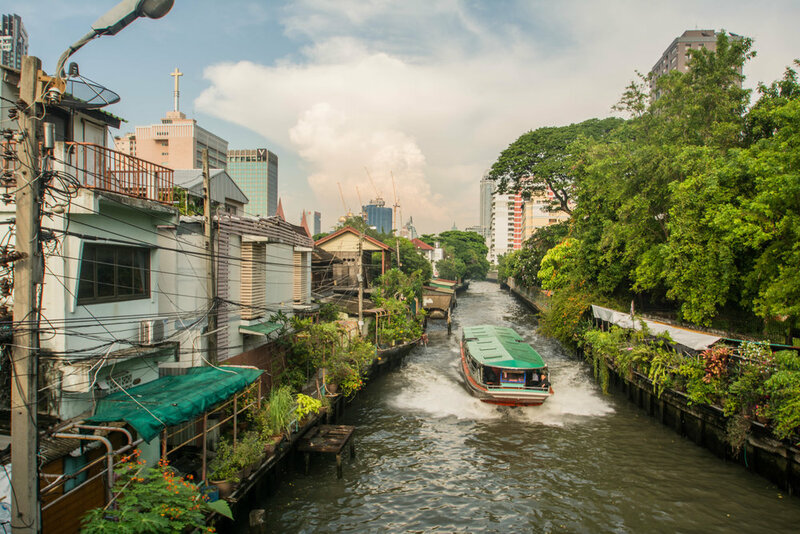 Moving as many as 240,000 daily passengers, Bangkok's MRT subway—along with the BTS Skytrain, bus rapid transit and Saen Saep canal boats—helps to mitigate the city's dependence on private car trips. Vietnam has mass transit plans of its own, including an existing BRT system in Hanoi and rail projects underway in both Ho Chi Minh City and Hanoi, and eventually intends to ban motorbikes from both of its largest cities—a plan facing some predictable backlash and an uncertain future considering 90% of Hanoi residents get around on two wheels. Unlike Thailand, Vietnam’s goals for urban transportation feature the private automobile less prominently. It maintains an impressively high taxation regime on automobiles, making them difficult to afford, which is less of a problem considering cars often can’t fit in many of Vietnam’s hyper-space-efficient urban streets. In contrast, Thailand’s auto manufacturers enjoy a more liberalized and regulation-light business environment, with trade policy in the region trending toward lower import taxation. Thailand has even been called by some the “Detroit of Southeast Asia.” Nevertheless, automobile growth in Vietnam has increased by double digits in recent years. The Vietnamese government will no doubt face a choice between supporting regional manufacturers or effectively jump-starting automobile ownership in its cities—which could have deleterious effects on the vibrancy of the Vietnamese street should city governments shift their emphasis away from long-term mass transit goals toward highway and toll road projects. The effects of a car-dominated mobility hierarchy on the street experience, and mobility in general, are easily observed in many of Bangkok’s newer urban districts. Commercial streets in Ratchathewi, for example, are bisected by an eight-lane thoroughfare that must be crossed by pedestrian bridges or the elevated BTS Skytrain platforms. While traffic congestion plagues the city’s roads, the streets themselves feel desolate in many districts, partially due to Bangkok’s ban on street food in some areas, citing a desire to “restore order” and promote “cleanliness.” Street food would not pass an American health inspection, to put it lightly, but an outright ban can have long-term repercussions on the liveliness and economic opportunity of the public realm. Many sidewalks, especially in Bangkok’s mall-saturated central districts, feel devoid of visual interest and activity. Their only goal is to draw the would-be shopper inside, or guide motorists into parking facilities. By comparison, Hanoi’s Old Quarter—the most tourist-driven area of the city—contains only one mall, Trang Tien Plaza, which is a fraction of the size of even a moderately-sized Bangkok offering. Instead, its streets are an exciting and ever-changing blend of hawkers, pedestrians, street food, and motorbikes. "Bike boxes"—dedicated spaces at the front of intersections to give two-wheeled motorists a head start on car traffic—help maintain fluidity between modes in Bangkok, where the car is king. No such facilities are required in Vietnamese cities where motorbikes make up the majority of vehicle trips. Retail is Bangkok’s largest economic sector, making up one-quarter of its total economic output. 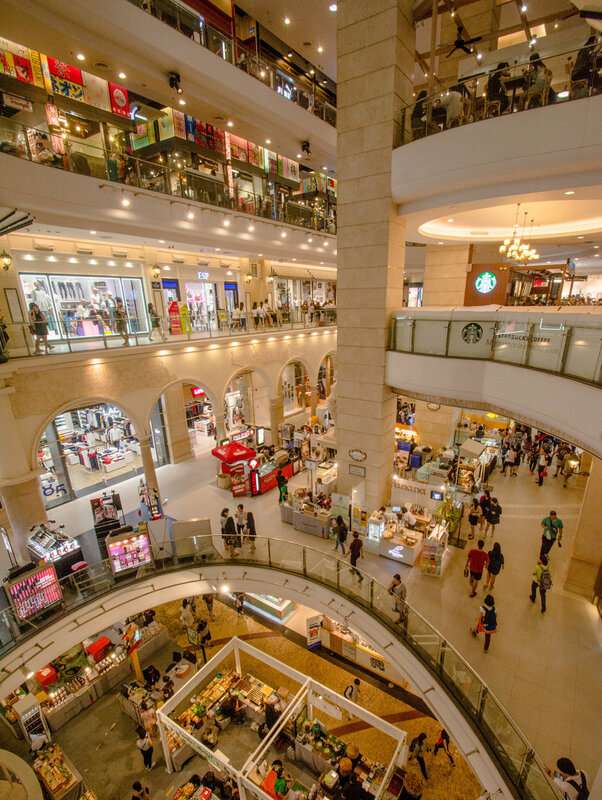 Malls and indoor food courts are a fixture of much of Bangkok, and even in their incredible size fill to the brim with locals and tourists in search of clothing, movie theaters, or perhaps nothing more than the icy rush of industrial-scale air conditioning. Lonely Planet books and Bangkok food blogs often direct readers to a mall food court for a meal, and even Bangkok.com promotes them as a “pleasant alternative to the bustling hot markets.” Which is not to say Bangkok’s night markets are wanting for visitors—as the crowds at Chatuchak or JJ Green Markets would attest—but they are far fewer in number compared to the ubiquitous shopping malls in the city. In many parts of Bangkok, one does not stumble on street food spots as much as travel to them—often by car, taxi or train. Ratchada, one of the city’s highly popular night markets, is hidden behind the gargantuan Esplanade shopping mall and requires a journey through automobile access roads and parking to reach. The Yellow Mellow outdoor market occupies a narrow lot sandwiched between two malls in Siam Square. The proximity of many popular night markets to shopping plazas makes for a striking juxtaposition, but aesthetically and functionally these outdoor offerings have more in common with their modern, air-conditioned counterparts than the informal gatherings of hawkers that occur organically on the streets of Vietnam. 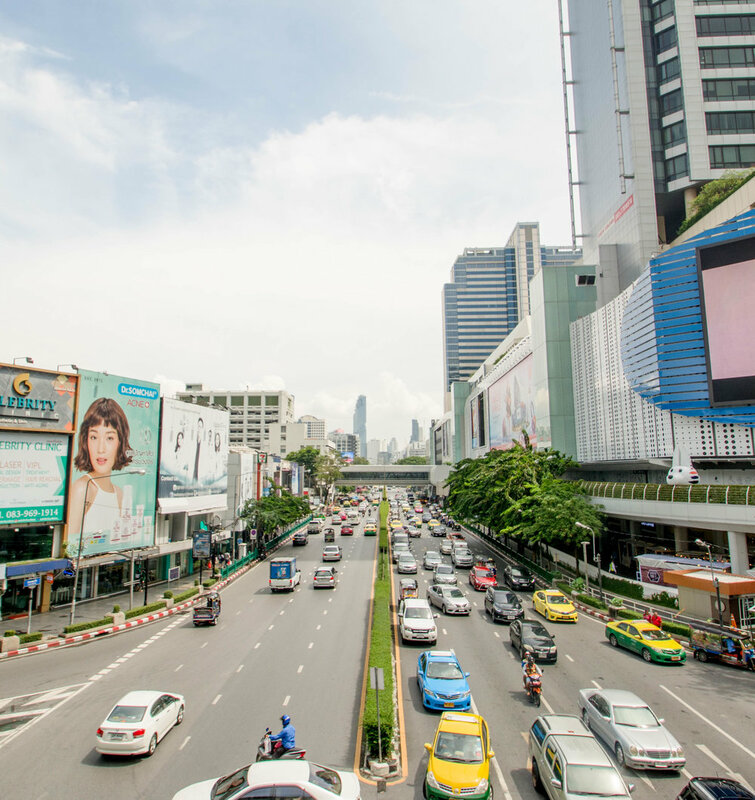 Shopping malls in many of Bangkok's newer districts—anchored by the auto-oriented infrastructure surrounding them—have replaced active streets as the primary areas of pedestrian activity. Whether in Hanoi or Bangkok, the pedestrian experience can be uncomfortable and even dangerous. But the dynamic level on which the Vietnamese street can operate seems rarer in Bangkok, where in many places the walking experience more closely resembles one along a suburban highway (an experience we at The Homage Project know all too well). Motorbikes can clog roadways all the same, but they cannot create the sense of complete impenetrability one feels when faced with four lanes of speeding car traffic. Motorbikes can navigate narrow spaces and behave in an organic manner akin to pedestrians or cyclists; private automobiles occupy an amount of space disproportionate to the amount of passengers they are typically transporting, and with ample blind spots and physical barriers between drivers and the outside world, are much less sensitive to their surroundings. Vietnam is a rapidly developing nation still willing to, at least for the foreseeable future, limit automobiles in major cities by way of taxation. Nevertheless, the car remains a status symbol worldwide, and motorbike culture may not stick around the streets of Saigon and Hanoi forever. But should Vietnam’s city and national governments stick to their stated mass transit goals, they will have seized a valuable opportunity to preserve the vibrancy and public ownership of the street. 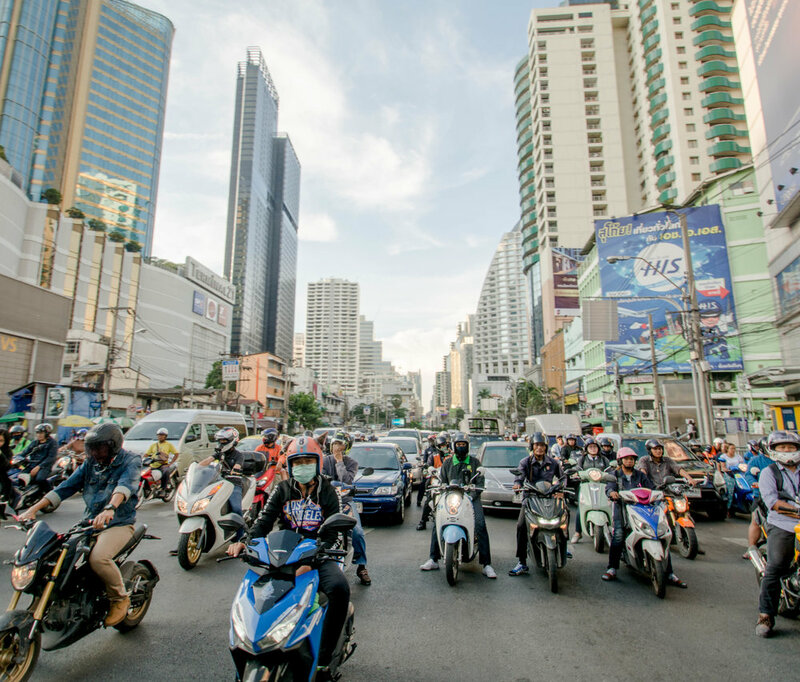 If motorbikes are indeed banned from Hanoi and Ho Chi Minh City, it is imperative that sufficient transit, cycling, and pedestrian alternatives take their place instead of cars. In order for urban environments to retain a human scale and foster human interaction, they must be adapted to a variety of transportation options. We cannot allow automobile-driven development to strip cities of interesting, flexible, and active streets.